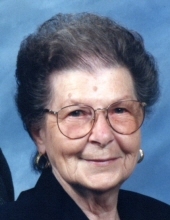 Josephine C. Dyke, age 95 of Verona, passed away on Saturday, September 1, 2018 at Agrace Hospice Care in Fitchburg. She was born on June 6, 1923 in Plain, WI the daughter of Alois and Christina (Schwartz) Ruhland. On April 11, 1942, she married the love of her life, Walter Lawrence Dyke in Madison and celebrated 60 years of marriage before his death in 2002. Josephine retired in 1986 after 21 years at J C Penney’s. She loved the outdoors, was an avid walker and gardener and enjoyed golfing, bowling, cards, dancing and traveling with Walter. She was a loving and devoted wife, mother and grandmother with a passion for cooking for her family, friends and neighbors. She’ll be remembered for her famous “sweet rolls”, her “Grandma Mondays” and many acts of kindness. Survivors include her daughter, Kimberly (Michael) Grosse of Cross Plains, 2 granddaughters, Cassandra (Heath) Lauden of La Crosse, Amanda Grosse and Marc Misch of La Crescent, MN, a great grandson, Everett Lauden of La Crosse, a brother, Louis (Faith) Ruhland of Kelso, WA, a sister, Diane Ruhland of Verona, 2 sisters-in-law, Luena Meister of Plain, Luci Dyke of Gold Canyon, AR, a brother-in-law, Donald (Lucille) Dyke of Reedsburg, many nieces, nephews, other relatives and friends. She was preceded in death by her parents, Alois and Christina Ruhland, her husband, Walter Lawrence Dyke, 3 sisters, Florence (Dave) Hogan, Irma (Wally) Haas, Bernadine (Cyril) Volk, 3 brothers, Edward (Lucy), Charles and Daniel Ruhland, mother and father-in-law, Walter “Norman” and Blanche Dyke, 2 sisters-in-law, Bernice (Carl) Schwarz, Edith Ruhland and a brother-in-law, Lyle Dyke. A celebration of life service will be held on Saturday, September 22, 2018 at 11:00 A.M. at the Richardson-Stafford Funeral Home in Spring Green, WI. Fr. Robert Evenson will officiate with burial in the Spring Green Cemetery. Visitation will be held on Saturday from 10:00 A.M. until the time of service. In lieu of flowers, memorials may be made to Agrace Hospice Care, Fitchburg. Online condolences available at www.staffordfuneralhomes.com. The Richardson-Stafford Funeral Home is assisting the family with the arrangements. "Email Address" would like to share the life celebration of Josephine C. Dyke. Click on the "link" to go to share a favorite memory or leave a condolence message for the family.